John Caulfield is adamant that his team’s poor form will improve. Cork City manager John Caulfield. 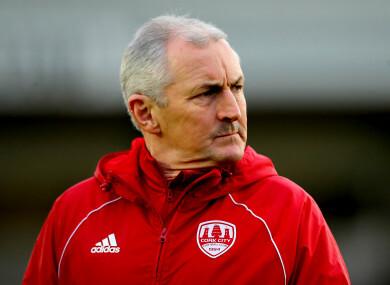 CORK CITY MANAGER John Caulfield has expressed confidence that his side can recover from their abject start to the season while he remains at the helm. City are only one point above the relegation play-off spot, having taken just 11 of the 30 points on offer to them so far this season. The current situation is stark for a team who haven’t finished outside the top two since Caulfield took over ahead of the 2014 campaign. “We had a good discussion with the lads this morning. They’re disappointed with what’s gone on. But we’re very tight-knit. Everyone is working extremely hard. I believe in these guys. We can see their talent,” Caulfield said this afternoon. Last Friday, City leaked a 90th-minute equaliser at home to a St Patrick’s Athletic team who played the majority of the game with 10 men. That was followed on Monday by a 2-1 defeat away to a UCD side who were still behind with five minutes of normal time remaining. He added: “Do I think we should be higher up the table? I do. Do I think we can get into the top four and qualify for Europe? Absolutely. We’re totally determined and we believe that we will turn it around. We just need everyone to be united within the group here, which they are. Caulfield dismissed suggestions of a rift with midfielder Garry Buckley over an incident that occurred during the defeat at UCD. The pair appeared to have a brief row on the touchline after Buckley failed to keep the ball in play from a defensive clearance. “People put legs on stories,” Caulfield said. “There’s nothing, absolutely. It’s laughable what was being said. We heard it yesterday when we were in the Mardyke. Myself and Garry were laughing at it. “Do we have words in the dressing room with the players? That’s always been the case. Ever since the day we came in, there’s always been words said behind closed doors, or whatever. But as a group they go out and they fight for their lives. That’s what they’ve always done. Having lost three of their last four Premier Division fixtures, Cork City travel to Waterford on Friday night for a meeting with a team who defeated them 2-0 at Turner’s Cross earlier in the season. For Caulfield, whose side were reigning Premier Division and FAI Cup champions this time last year, the pressure will increase if they fail to yield a positive result at the RSC. When asked if he’s concerned that his job could be at stake if results don’t improve, the Cork City boss said: “I have no control over that. That’s their [the board's] choice. “At the end of the day, the management team came in when the club was on its knees, seriously in debt, seriously down the table, crowds of less than a thousand. The team have been in the top two for the last five years, in four [FAI] Cup finals, a double, back-to-back [FAI] Cups, in Europe every year. “There have been massive cuts within the club, massive changes to budgets. We work within the structures and within the ethos of what the club want to do, what the board want us to do. That’s their choice. I can only do my best every day. That’s what the management team do. We do our best every day. Over the last five or six years it has been excellent. “People can see with the huge turnaround of players that has happened this year, it was always going to be a tough year. It is, there’s no doubt about that. All I can do is work as hard as I can every day. Email “'People put legs on stories' - Cork City boss brushes off 'laughable' reaction to Buckley row”. Feedback on “'People put legs on stories' - Cork City boss brushes off 'laughable' reaction to Buckley row”.